We leave you with a two-part article, one from Rachel and one from Christine, continuing from this issue's theme of making a statement. Each woman’s style, and hence her way of building outfits, is unique. But to make it easier, I have broken down the core parts of an outfit that can be applied to create any effect. Every outfit should have basics, a statement focal point, a finishing piece, and basic accessories. Most of my clients come to me wearing outfits that are missing some of these parts, which tends to mean their outfits look unfinished, bland, or both. Since you, like most of my clients, probably have a good understanding of what basics are and have a closet full of them, I’ll skip on ahead. Almost universally, my clients are missing statement focal points in their outfits. Every outfit, like any other artistic composition, needs a place for the viewer’s eye to go. When the eye meanders without a stopping point, it struggles to bring the whole composition into focus—which is an artsy way of saying that it gets bored. A statement focal point can be any part of the outfit, from a blouse to a pair of earrings or even shoes, it just has to have the power to draw the eye. One trick I like to use for a quick wardrobe boost is to use jewelry this way, (hence the topic of this issue) since it can be worn with lots of outfits that may be lacking a focal point. What will qualify as a statement focal point will vary depending on your physical design and your style, but in general, these pieces tend to have a color, pattern, design detail, material, or larger scale that stands out. Simple, neutral, solid pieces in common fabrics don’t tend to draw the eye (those pieces would be basics). Color is one of the easiest ways to create a focal point, but it's also dependent on the type of color and the overall color composition of the outfit. A color piece becomes a focal point when it is more eye-catching than the other elements at play. The most typical reason this happens is due to some form of contrast (where it is critical to remember that contrast is relative to the innate contrast level of your palette). Value contrast (i.e. a bright silver necklace on a black dress) can be used this way, but more commonly it is some form of color contrast that is used. A more colorful choice from a particular palette against a neutral ground is one of the easiest techniques to employ, though interesting effects can also be created by playing warm against cool, even for the true seasons who each have purple and blue as well as red and yellow in their palettes. In any composition, warmer objective hues like red and yellow (more from Christine on red in a moment) tend to come forward most, something to keep in mind if your style involves a lot of multicolor effects. Detail can be defined as "complexity of shape", meaning that there is more complexity to the design than the bare minimum necessary to construct the garment and be able to take it on and off. This might be something as simple as oversize or contrasting buttons, or as over the top as a giant ruffle, depending on your image archetype and personal expression of said archetype. Detail does not need to be structural in any way, as is the case for example with a beaded applique. Fabrics can have a tremendous effect on how predominant a particular item is in the composition. Some textures and finishes draw the eye more than others - an oversize coat in a smooth black wool might feel very basic, while the same in goat hair would be a statement. It's not just rugged textures that can have this eye-catching effect, as reflectivity can hugely affect a garment's power to draw the eye (one of many reasons why jewelry is such an easy item to use in this way). Certain sheer textures can also have this effect, as can a wide array of other fabrics that diverge from the norm of smooth, flat and opaque. Probably the simplest method of all of creating importance in a piece is to just make it bigger. Of course, it should be noted that scale is relative, so in order for this to work, the object in question must be large relative to the person wearing it, to the other objects in the composition, or than that type of object would normally be, or very likely more than one of these factors. Pattern is an excellent way to create a focal point, but not ALL patterned items are focal points. A scarf with a soft monochrome watercolor print might not be enough to draw the eye, and some women even enjoy wearing more than one pattern at once, in which case one will have to be more dominant. I've left this one for last, because what makes a pattern a focal point can be a combination of any of the elements previously mentioned. As with color, contrast is one way patterns become more prominent in the composition, but not the only qualifying factor. Shape is also at play - we tend to focus better on shapes with crisper lines, so more graphic prints will tend to pull focus more. Of course, this goes hand in hand with scale, as defined above, where larger patterns tend to have more impact. Finally, there is one last thing to mention here, which is motif. Recognizable motifs, which can be as basic as flowers or as esoteric as dinosaurs, tend to draw the eye more than abstract ones. It's human nature to want to look at an assembly of shapes and pick out flora, fauna, and other familiar objects. So a blouse with little birds catches the eye more than little dots. This is especially true when the motif is instantly recognizable yet unusual in context, as it would be if we made our little birds into little eyes. Depending on your unique factors - season, body type, preferences, lifestyle, age, etc. some of these tools will work better for you and others not at all. You might employ one approach all the time, or vary it day by day. But if you change one thing about your outfits, make it this. Statement focal pieces have the most power of any outfit component to communicate something about you to the world, so they represent a huge opportunity for you to express yourself and define how you want to be seen. Undertone is a concept that we hear about often, related to many aspects of appearance. With cosmetics, it usually refers to the warm-neutral-cool base of foundation. If there were only one meaning, there would be no confusion. Although we often see (and I have used) red for Winters, blue for Summers, yellow for Springs, and orange for Autumns, these may be better referred to as core colours for those applications that use colour energy for well-being and healing. Today, I think of colour analysis undertone as the colour in the base layer of skin, where the blood flows through the capillaries. The colour will be some variation of red and probably moves through a range for people within a Season. Whether the red colour is a result of humans having different colours of blood or it is the red seen through the filter of the other pigments in the overlying skin, and even the walls of the blood vessels, is unknown to me, but it is true that every type of colouring (Season) has a range of reds. 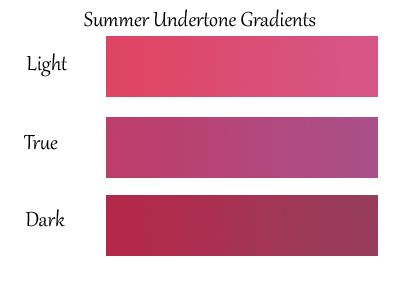 Instead of a pinning down a single red, which may not be possible, or even exist, the best use of undertone may be as a gradient. When we wear these colours, the viewer senses the energy and alignment. They create visual excitement, as red always does, and have a powerful capacity to improve our appearance. Harmony is another word with more than one interpretation. It has one meaning, which is overall agreement, but we may agree or disagree about when it is achieved or when it becomes disturbed. Colour analysts are taught how to measure its effects and appearance, but there is always the component of how colour feels to each one of us. People within a Season share the same reactions to colour and they paint their own artistry on top. Variations of the same flavor or scent widen our experience of how to world could be, still sharing what the flavor or scent have in common. Few cooks are putting banana into tomato basil soup and I don’t see orange and camel in anybody’s True Summer Pinterest boards. The system is here to give us structure; we know where we fit and can explore our territory safely. Our coaches, who might be our colour analysts and friends in our Season groups, guide us to discover our colours in a supported way. Over time, all of us here have come to realize the intelligent compromises that shopping requires. Few items are perfect in every way and nor do they need to be. We have so many layers in our beings that the average person within a Season barely exists. Shopping can be a quest, a frustration, a game, and a simple appreciation for visual beauty. When an item hits the bull’s eye in all of its colours, we recognize harmony, the sense of global peace or agreement. We might find it in different colours and combinations, but in general, humans share much more than they differ in how colour energy is felt. As always when presented with the opinions of others, our job is to check in with ourselves and decide if we feel the same way, and if not, then how do we feel. Below, the four panels present an idea for the gradients that might belong to the 12 Seasons. The colours are far from absolute and are suggested as a more practical, and perhaps realistic, way of thinking about undertone, instead of a theoretical concept that is so confined as to be of little use. Gradients of light to dark ranges could be overlaid on the reds, and many other gradients too, as colour and human beings acquire complexity. I stayed in the medium ranges to keep the darkness levels similar to that of blood and be easier to compare. Following that is a link to a catalog showing necklaces that might illustrate an undertone colour especially well, or feels harmonious in its colours to my eyes and energy, or illustrates the Season especially well or unusually, along with some informal conversation between friends. But don’t take my word it. Use the pictures as a springboard to discover your own feelings and opinion. As we bring Signature/STYLE to a close, we would like to extend our sincere thanks to you, our readers. I hope that we have learned from one another as we saw colour and style through one another’s eyes. The lists of email addresses will be deleted on January 30, 2018, as will the entire account. There will be no record of the names and email addresses on our subscriber lists.